Regular Rate $2289 . Today Only $599! The Krystal Cancun offers the best of both worlds. It is in the prime area of Punta Cancun and boasts a fantastic and convenient location within walking distance of shopping, nightlife and hotel zone attractions yet once you step through our doors, leave the hustle and bustle of the world behind as you relax on our stretch of white sand beach, take a dip in our hotel's panoramic pool, or enjoy a massage at the spa or even better, abandon yourself in our beach bali beds. Everything you could need or want is at your fingertips and our goal is to ensure your ultimate relaxation. This stunning all-inclusive resort offers a huge variety of services and amenities plus luxury guest accommodations. We'll tantalize your palate with a wide range of cuisines in our three restaurants, cool your thirst at our three bars. Boasting an oceanfront setting in the heart of Cancun's hotel zone on the largest beach in town! Best Location in Cancun! The hotel is located in Punta Cancun, the heart of activities and entertainment. Located between 2 of Cancun's most popular malls and less than a 2 minute walk from all of the most popular restaurants and nightclubs, the Krystal has the undisputed best location in Cancun! When it's time to get away from it all, come to Cancun and let us pamper you at the Krystal Cancun. Largest Section of White Sandy Beach in Cancun with Panoramic Caribbean Views. Located in the Heart of the Activities and Entertainment District of Cancun. Tantalize your Palate with a Wide Range of Cuisines in Our Three Restaurants, Cool Your Thirst at Our Three Bars. I recently got back from my stay at the Krystal and I have to say what an excellent experience I had, the room was clean and the service was great, everyone was very friendly and helpful. Another plus is that it right in walking distance to everything, the shops, clubs, restaurants. I am planning another trip back next year at this hotel. I would definitely recommend this hotel to anyone. Deluxe Rooms come with a king bed or two double beds. There is nothing standard about these hotel rooms. All rooms include: mini bar, electronic safety deposit box inside the closet, flat screen color TV, Bath amenities include shampoo, body lotion, soap, towels. Maximum occupancy of 4 guests. NEW HUGE BEACH!!! The new beach restoration project just created expanded the beach to about 100 yards wide, the biggest beach in Cancun!! Beautiful Room with king or double beds. Lunch a la carte (buffet seasonal). Dinner at the awarded specialty restaurant El Mortero. Wine of the house by the glass. All Beverages during bars operational hours. Domestic and selected international brands. Bottles of water in the room (restocked daily). Snacks from 12 to 5 pm by the pool area. 2 Restaurants including Buffets & A la Carte Speciality. Water sports available at the hotels marina. One of the largest ocean front pools in Cancun (heated). A delicious variety of local and international dishes served in an air-conditioned area overlooking the pool. 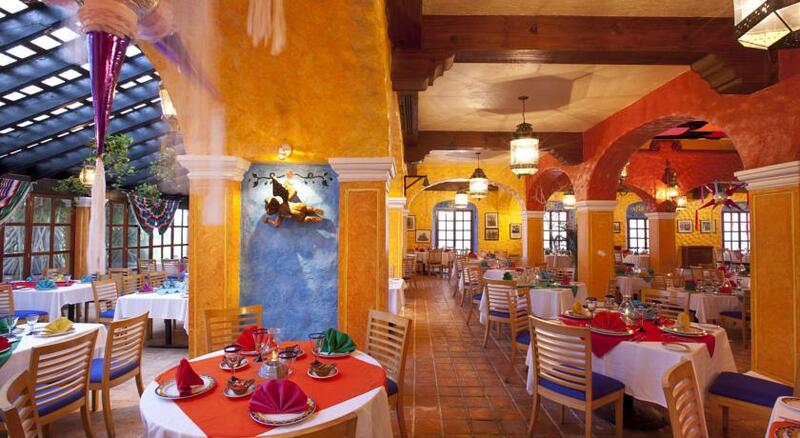 Try mouth-watering Mexican specialties at the breakfast buffet. Lunch and Dinner are a la carte. Situated conveniently by the main pool, the restaurant allows you to enjoy snacks, as well as delicious surf and turf specialties, while experiencing an amazing view of the sweeping beach and Caribbean Sea. Buffet Lunch is served seasonally and a la carte service available. Sunbathe in comfort on padded lounge chairs. Appetizer service, tropical snacks and drinks. This is the ideal place to relax. The perfect meeting place with drinks, cocktails, billiard tables, and of course, an All Day Happy Hour. Relax on your own swing seat with refreshing drinks served by the infinity whirlpool. We Saved Over $1400 On BookVIP.com - What More Could You Asked For! Hey, we are enjoying a beautiful vacation at the Krystal Resort. I want to thank Bookvip.com for giving us a great time. I recommend anybody to come and stay. Really enjoyed our vacation at the Krystal Resort. The resort is amazing, the water is beautiful. Incredible deal from Bookvip.com. It's worth every penny! Beautiful Room, beautiful scenery, great weather, beautiful beaches. The Krystal Resort is right next door to everything you need from shopping, restaurants, water sports. You should be here! I'm out here in Cancun, Mexico at the Krystal Resort. Bookvip is definitely a good deal out here. This will definitely work out for you. Me and my girl came out here and we love it. This is an excellent view. I made our reservation with Bookvip. They are very good, nice and it was really worth it. I recommend all the reservation with Bookvip. They are the best views I have ever seen. Krystal Resort Manager Praises BookVIP.com For Almost 8 Years Working Together! My wife, 2 daughters, FIL and I stayed at the Krystal hotel and had these 2 gentlemen serve us our meals during our stay. They were tremendously attentive and exceptionally skilled at what they do. Whatever we asked for or needed they made happen. Their names were Venustiano and Capitan Alfredo. I would go back just to have them serve us on our next Cancun stay. I must say this was one of the best vacations we ever had. We booked an all inclusive package on southwestvacations.com. The hotels locations is very good and the beach was perfect. My kids really enjoyed all of the amenities, especially the food. There are lots of hotels in the area but Krystal had the prices that fit our budget and we were very happy with our stay there. I cannot wait to go back to Cancun and visit Krystal again. "the carribean sea meets 42 nd st"
we purchased our membership at Krystal in 1994, and get to go there every 1-2 years. We LOVE the water and the beach, probably the best we have ever been to, including Hawaii. Many of the staff have been there longer than we have and it feels like going home. We have watched both the beach and the hotel evolve over the years. It looks the best it ever has but you have got to change the "European furniture", we want MEXICO flowers, wicker etc. The pool area is sleek, modern, and clean. WE spent most of our days on the beach and in the water. We still enjoy going out to the multitude of local restaurants, shopping and tours, WE got home 2 days ago and are already planning our return next year. Not only did we have a spectacular view from our room on the 6th floor of tower one, but we could see the OSPREY nest on the Texmex tower from our bedroom.!!!!!!!!!!!!!!!! The new balconies have been long awaited and I was up and watching the sunrise over the water from it. Even with its faults we have traveled there with family, friends, staff, and given our week as xmas presents when we knew we would not be able to use our week. We upgraded 2 years ago, so we no longer get hassled with the time share promotions. We love KRYSTAL and am so glad that our investment had gone to improving the hotel. I still hate the furniture in the rooms, but I love Krystal! Not my first time to Cancun but my first time at the Krystal. Stayed for a week in early December. Had a lovely ocean view and really enjoyed the property - from its central location near the nightlife, to the excellent beach area and spacious hotel grounds. What really made the trip for me though, were the hotel staff! To acknowledge my favorites: Christian, the outside bartender, was always smiling and such a pleasure to be around. Adrian was awesome! He and Oscar were always conjuring up some kind of fun day and night and making me smile! Great guys. Check-in was smooth, front desk/concierge was helpful, all-inclusive plan was worth it. Everybody was just so nice. Thanks for a great vacation Krystal, I will stay here again! "Great Value and location is unbeatable"
My husband and I stayed here with another couple back in May. I am SUPER late writing this review but I made notes while staying there. I rely heavily on Trip Advisor when making hotel choices so even though it's late..I still felt it would be worth it if it could help someone. We usually stay at Palace resorts(Le blanc and Sun Palace) but came across this ridiculously good deal online that only required us to go to a presentation. Now keep in mind we were well aware of what this presentation meant before booking, but for the price I really couldn't say no since it was basically almost free! The rooms were decent with mediocre beds..but honestly after a full day of sun and drinking we didn't mind the beds at all lol. We had an ocean view room and the the view was AMAZING. Location is fantastic! It is next to all the big night clubs...a mall..a flea market...good restaurants...bus stop. When we stay at the Palace resorts we always have to pay for cabs to get to these places so that was a bonus. The beach is the prettiest beach in cancun! I think the beach alone is worth staying here....the sand was so soft and there are hardly any waves so you can really walk out and see some pretty fish. Food is a killer deal with the all inclusive plan as it includes almost everything. The breakfast buffet was so good..it was probably my favorite part of the day and I'm not even a huge breakfast person. They had a lot of actual mexican food (unlike a lot of other resorts belive it or not) and they had a great smoothie bar which even served up healthy green smoothies. Was the food 5 star quality..no, but I was impressed by their diverse selection and appreciated that they had actual mexican food! When I went there was a restaurant next door that was included. I can't remember the name of it but all I can say is that it is the best mexican food I have ever had....I am not exaggerating. I am not sure if this restaurant is still part of their all inclusive plan but just in case it isn't I won't brag on it any longer :) Overall this was definitely an adventure stay for us since we usually like to stay at the top hotels here, but we were very impressed with what this hotel had to offer! We have been coming to the Krystal for over 30 years and have come back every year around Christmas time. The personnel at the Krystal are excellent. They care about your stay and take care of any problems you may have. We especially want to mention Carlos Bracamonte, Ernesto Orozco, and Rafael the bell captain, all of whom are exceptional in making sure your stay is enjoyable. This is one of the main reasons we keep coming back to the Krystal. The restored beach is now excellent as it was 30 years ago. "Great place to stay with a good location"
I recently visted cancun at the end of november. I was pleased to find Krystal was in walking distance of all the evening entertainment and had a bus stop very near to travel down town. We chose a club room wgich was situated in the new part of the Hotel - it had a ocean view (amazing) which was lovely and clean. - we thought the club room would include the breakfast in the resteraunt as with other hotels I have stayed in but unfortunatley is was a less extensive choice in a smaller room which catered a internation breakfast. - most days we payed the extra for the food we wanted. All staff friendly and spoke english well. The bell boys - Huan and Jose were super and very helpful. As were the hotel reps who included you in actvities by the beach! Yet another perfect vacation at the Krystal Cancun. The beach is one of the best in Cancun. And the location is convenient to everything. Our room was beautiful and the view from our balcony was breathtaking. The food was delicious and the service was attentive. Balam and Asterio could be servers at the finest of restaurants. They anticipated our every desire and even did a little more, just to make us happy. I went scuba diving at solobuceo, located nearby the hotel. Jaime, the divemaster, kept an eye on everything to make sure that the dive was a safe one. We went to the new Mayan Museum, located on Kulkulkan Blvd. There are some small ruins located on the property and there are many artifacts on exhibit form Mayan antiquity. Also, there are Iguanas that pose on the ruins for photographs. "Very Nice Vacation - Would Go Again"
Christian Cantinero, Choco, Oscar and Adrian made this trip extra enjoyable. Ocean front view was stunning. Pleasant wait staff, powdered sugar sand, beds on the beach, clean pools, etc. The property on the beach was spacious - did not feel that we had to stay in one spot. Could easily take a mile or so run and not feel unsafe or anything. Believe me, they lost money on us with the all-inclusive deal. The room may have only been worth $150 US, but I was pleasantly surprised to find there were very few limits to food and drink in the all-inclusive package. The only thing not included were some top-shelf liquors, but most waiters served it to you anyway. Even one outside restaurant was included, full menu. Crazy. For the price, and the enjoyment of Mexican weather in December, I would sure do it again and might bring our teenage son next time, due to the unlimited food. "Overall . . . Great"
The property is beautiful. The pools and beach were great. Very scenic and peaceful. The staff was professional and very nice. The food varied from ok at the buffet to delicious in the specialty restaurants. I'd stay here again. Incredible beachfront location and an excellent value. We upgraded to the all-inclusive plan and found it worth the money. The beachside and room service were both great. The food was better than other, more expensive, resorts. The seafood was the best choice for lunch and dinner. The made to order omelets and French toast were delicious choices for breakfast. 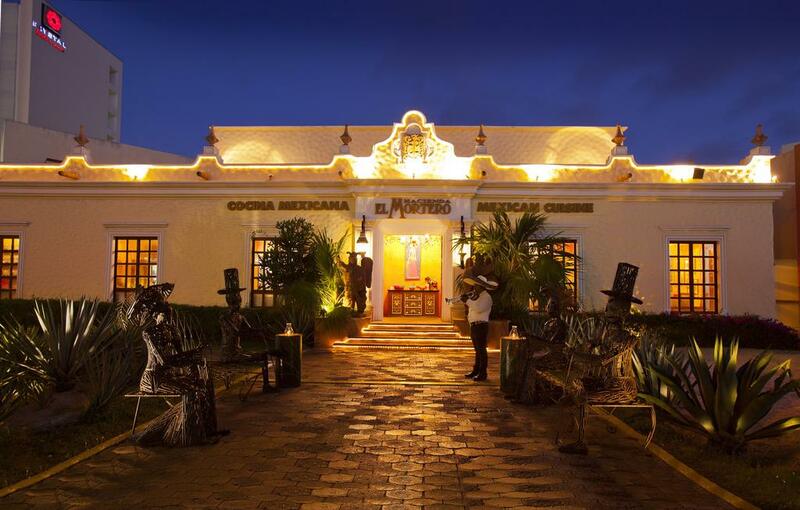 Mortero's restaurant was part of the all-inclusive plan and the food and service there was impressive, great atmosphere complete with mariachi band. The staff was the most impressive part of the resort, we were treated extremely well by each and every staff member. The resort does not have a hot tub and the air conditioning is unable to cool the room with the door to the balcony open. One of the best features of the Krystal Hotel, is its well placed beachfront location! This resort is practically at the end of the hotel zone strip where the Caribbean Sea enters into a bay like area. As a result, theres added protection from the rough seas which definitely makes swimming and body surfing more enjoyable (and safer) than most of the open areas along the strip. The beautiful outdoor lay-out is definitely another great asset to this resort. At the centre, is a columns monument surrounded by various swimming pools to suit everyoness needs. The main pool is an eye catching free-form pool with a pretty fountain on an island in the middle and infinity edge beyond this. When youre in this pool and look beyond the fountain towards the beach, it appears as if the pool extends into the stunning turquoise sea. You can swim from this pool through a mini tunnel into a deep water pool with a small but dramatic waterfall. Now for the food - On a positive note, I really liked their breakfast buffet which came with a wonderful variety of fresh fruit. The selections from the buffet which really stood out for me were the gnocchi at dinner (in the Aquamarina restaurant) and the seafood ceviche (at Las Velas) for lunch. The ceviche was excellent and I just couldnt get enough of it. I had met a couple of lovely Mexican guests at the pool one day, who also ordered this along with some tortilla chips and beer by the pool. What a great way to enjoy happy hour and watch the sunset! If you have the all-inclusive, this will not be extra, but its definitely worth ordering even if you dont have the all-inclusive. Although the Krystal Hotel is a very nice resort, its not a 5 star luxury one. As a result, if you like little extras, I would highly recommend getting a Krystal Club room! It is definitely worth the additional cost for all the advantages it offers. (Note: If youre a student on a budget, dont pay attention to this because youll have a great time no matter what). That said, I was with a group and we got the (adult) Club all-inclusive. Our rooms were located in a separate building from the main tower where we all had private balconies with stunning ocean views. The Club option also gave us access to the Club Krystal lounge located on the 8th floor of the main building. For those who want to have breakfast in a quiet atmosphere, you can go to this lounge where they also have a nice espresso machine. So you can enjoy your espresso coffee while sitting outside on a balcony at one of their tables from the 8th floor, which has a breathtaking view of the resort and beach. The Club Krystal lounge also offers a small but nice variety of munchies at happy hour. Speaking of food (again), you can either get an all-inclusive meal package with the Club option or not. One of the best features of the Club Krystal is that there is a concierge who will take care of you during your stay. As we found out, Patricia was the perfect person for this job. She was so personable and helped us with everything. Patricia also facilitated our check-out from the hotel. So, instead of waiting in line at the front desk, all we had to do was go to the lounge on the 8th floor and check-out there. Her pleasant character and overall helpfulness demonstrated that she is a wonderful ambassador for this hotel. Another staff member that definitely deserves mentioning, is the good humoured and hard working activities director Oscar. He organized all kinds of fun activities such as aquafit classes and karaoke night. Oscar has a great personality for this job and proved to be a good sport when he joined in on some of our own activities. His positive energy and participation with us made our stay even better! Free WiFi was a definite plus for me! I brought my laptop which I used everyday from my room. There was an in-room safe but it wasnt big enough for a laptop. So when I wasnt there, I simply left it in my suitcase which I always locked. To conclude, here are some tips to make your stay even better: TIPPING- Even though tips are included in the all-inclusive package, bring lots of US $1 bills for additional tipping, especially for those people who give you good service! Btw, the mixed drinks are somewhat watered down and I only had one really good margarita when I was there, so tipping your favourite bartender at the beginning of the week, probably wouldnt hurt. By mid-week I stopped having mixed drinks and instead ordered beer which was always good, especially when it was served in a chilled glass with a piece of lime!! The chambermaids work really hard and probably get paid the least. They not only did a good job but were always pleasant. They definitely deserved a good tip. WATER FROM MINI-BAR- There are 2 types of bottled water in the mini-bar; one bottle is complimentary, but the one with the Evian label, is not. The Evian water is expensive and if youre a big water drinker, your Evian bill can really add up. So, if It makes no difference to you, go with the other bottle. SUN PROTECTION-The sun is really strong and if youre planning to be outside at the beach or pool for the entire day, wear something on your head & reapply sunscreen. Better yet, pack a long sleeve water shirt & use it especially if youre going in and out of the water all day. I got a sunburn on the first day & had to borrow someones long sleeve surf shirt which I wore for the rest of the week during those intense peak hours. I think that it saved my vacation and my skin. "A great resort in a great location"
I stayed at the the Krystal in Cancun November 8-15th through an RCI trade. This is my third or fourth stay here and I love the resort. I tend to select the Krystal because out of all of the RCI resorts in Cancun, only a very small handful do not have the mandatory all-inclusive option. While some may prefer it, it is still an option here and I tend to like to try other restaurants while I'm on vacation. I ate at the resort a few times and was always very please with their food and their prices. As an RCI member, I had a 20% discount on all meals and drinks which was nice. The drinks were cheaper than at home and with a happy hour at noon by the pool bar and one at the indoor bar in the evening with 2-for-1 drinks, you can't beat it. All the staff were great from the moment I checked in. At check in they brought me a drink and asked me a few questions, and within minutes I was on my way to my room. The hospitality desk was always staffed and ready to answer any questions I had. This trip was mostly just a relaxing vacation and I didn't do any side trips. I mostly did a lot of swimming in the ocean and laying out at the pool. The positioning of this resort at the tip of where Cancun bends makes the ocean ideal since the water breaks a little at the tip creating a small area with fewer waves if you just want to swim while further down its full on wave action for those that like the heavier waves. The water is absolutely gorgeous and perfectly clear. The activities by the pool were always fun with daily bingo with prizes as well as pool volleyball and stretching in the water. 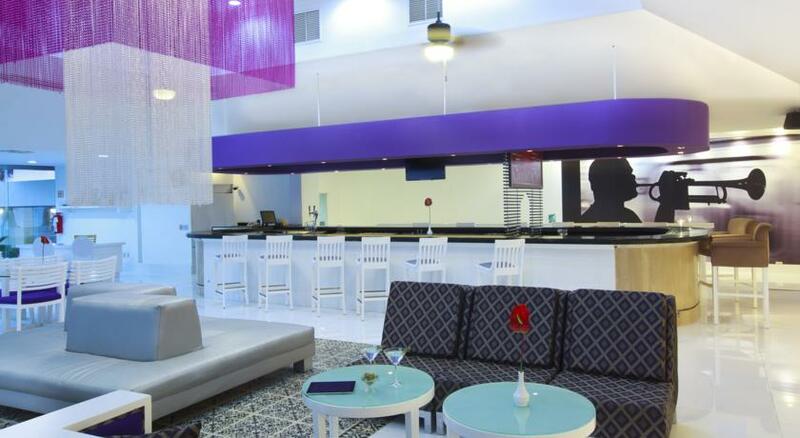 The resort is located walking distance to all the bars and nightclubs as well as 2 malls and inumerable restaurants. You just can't beat the location. As an RCI member, I was placed down in their smaller building which is only 3 levels tall and kind of hidden behind a palappa. That said, I had a great view of the beach from my room and was closer to the beach than either of the other two buildings. The rooms in that building are well maintained and impeccably clean. Maid service was availble every day, but I usualy just hung the "do not disturb sign" on the door. The beds were large (king size) and comfortable. One evening I ordered from the room service menu and the food came quickly and was very good. Their afternoon buffet out by the pool was excellent with steak, chicken or pork prepared to your order. I can't say enough positive feedback about the staff. I always found everyone to be courteous and helpful. Despite some rain on 2 of the days I was there, I had a great vacation and came back with a nice tan. I will definitely be back. There are nicer resorts in Cancun, but for the price, location, and service, the Krystal just can't be beat. "Family vacation to the Krystal"
We stayed at the Krystal in Cancun November 26th through December 1st. We got an amazing deal ( $199 all inclusive for myself, my spouse and our two teenage boys for 6 days). Yes, we did have to listen to a 3 hour time share presentation, however, it was worth it for the great deal. Location: Can't beat the beach and the central location to shopping and nightlife. Best beach in the area. Clean, no seaweed, calmer water than other parts of cancun, at the end of the strip so not as crowded. Rooms: I was stunned that an ocean view room with a balcony was included. AMAZING. The view is excellent. The rooms were clean, well stocked with water/beverages (also included), towels and toiletries. We also ordered room service several nights (again, included). Central areas were also clean, nicely furnished. Food: First of all, the service in the restaurants is top notch. A special shout out to Balam who remembered our names, our drink preferences and our favorite sports teams. Actually, all the servers were friendly and provided excellent service and should be commended. Food selection is limited as there is only the buffet which is open all day, the pool restaurant that is only open mid-day and the mexican restaurant only open at dinner. Room service is available as well. Check in: people have complained about check in. We arrived at 2 pm. Our room was ready. Julio brought us a drink at the reception desk, escorted us to our room and pointed out where everything was located. Smooth as can be. Facilities: I have boys and they were happy to sleep in and shoot pool. The pool is clean and large, the beach has plenty of beds and chairs, the gym was clean (a little hot) and had everything we needed. I would return to Cancun and stay at the Krystal again. The top notch service and the location would make it a five star resort, but the lack of food variety and the hot tub that isn't kept hot make it a four. Enjoy your trip fellow travelers. "Very clean and grounds beautiful"
Regular Rate $ 2289 . Today Only $599!